The Mercedes-Benz CLA 45 AMG is a strange car at first glance. It is small, powered by a tiny 2.0-litre, 4-cylinder turbocharged petrol engine, has an all-wheel drive system and an exhaust note that sounds feeble at idle. It is the antithesis of everything that AMG stands for. This is what I thought before I sat in the driver’s seat of the car. I was however proven wrong; very wrong! There is no doubt that the CLA 45 AMG is a stunner to look at, you may even call it the mini CLS if you like. The ‘Ah My God!’ campaign that Mercedes-Benz ran to promote the car is really justified. 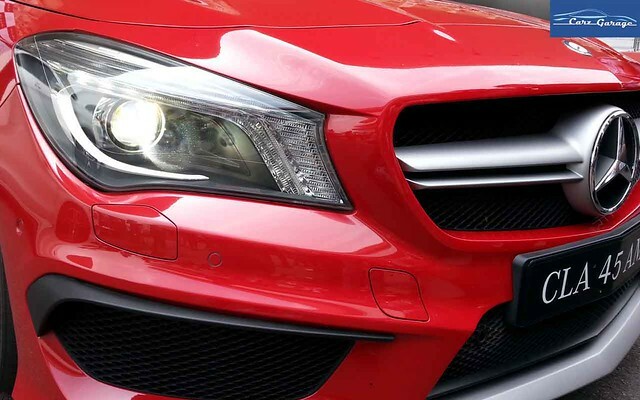 Just like its hatchback sibling the A-Class, the CLA 45 AMG is a head turner. AMG has garnished the CLA 45 with a matte titanium grey finish front spoiler, side sills and a rear diffuser. The car sits on 18-inch 5-spoke alloy wheels which are wrapped around 235/40 R18 rubber (you can see the red painted brake calipers through the wheels). The interior of the CLA 45 AMG is snug and compact. It also feels airy thanks to the sliding panoramic sunroof. Get inside the car, and you along with your co-passenger can make yourselves comfortable in the AMG bucket seats and look silly with the red seat belts. The rear seats are best only suited for kids, so just make sure that their stomachs are not full before embarking on an enthusiastic drive on twisty roads. 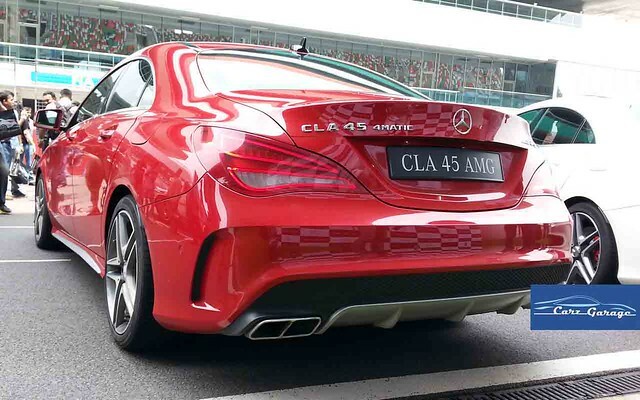 I drove the CLA 45 AMG on the Buddh International Circuit for just two laps. But the short drive was enough to prove that my thoughts about the car were wrong. The engine at idle settles for a muted note but don’t be mistaken by the feeble sound. I put the gearbox in Manual mode and thumped my foot on the accelerator pedal. I got the shock of my life by the roar it produced when I revved it to the redline. Tiny as it is, the 2.0-litre turbocharged unit has been tuned like crazy by the boffins at AMG to produce 355bhp @ 6000rpm and 450Nm from 2250-5000rpm (if you may want to know, it is the most powerful 4-cylinder engine in production). I was out of the circuit paddock in no time behind a SLS AMG lead car. I didn’t get to test the 0-100km/h claim of 4.6 seconds but I have no doubts about the authenticity. AMG have plonked in a 7-speed dual clutch transmission in the CLA 45 AMG and the in-gear acceleration is just ferocious. I did have a go at the claimed top speed of the car and my word, does it go. The top speed of the car has been electronically capped at 250km/h and thank god for that. Anymore and I am sure it will either break your spine or tear your face apart. Since sending 355bhp and 450Nm of torque through the front wheels is a crazy proposition, the guys from AMG fitted the car with Mercedes-Benz’s 4Matic all-wheel drive system. The 4Matic in the CLA 45 AMG sends 100% of the power to the front wheels as standard but when it senses that there is an enthusiastic or a nob of a driver behind the wheel it is ready to feed up to 50% of the power to the rear wheels when the situation demands. I could sense the system working overtime when I was driving the car. 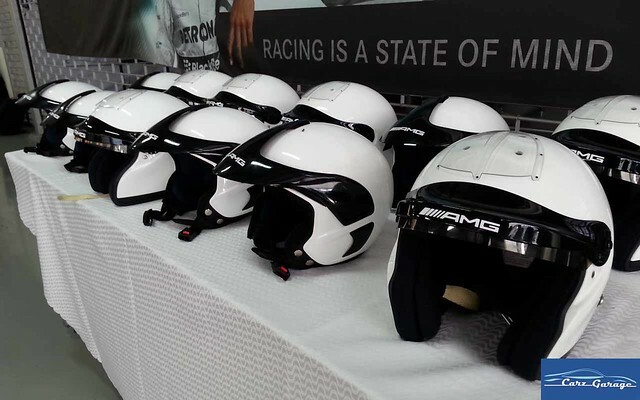 The grip from the 4Matic system is tremendous and it gives you the confidence to push the car harder at each corner. AMG has engineered the car for slight under-steer during fast cornering but good drivers will be able to make the car over-steer at will. The massive brakes with four-piston calipers at the front and single-piston calipers at the rear are phenomenal. They are perfectly calibrated and do their duty without any fuss even on cars which were driven continuously around the track for a few hours. I cannot tell you anything about ride quality of the car but the suspension of the car made sure that it stayed flat through the corners and the steering though numb is delightfully accurate. If you buy the car, I can guarantee that you will spend half of your time staring at it and smiling for buying such a gorgeous looking car. And when you drive it your will smile will grow from ear-to-ear because you bought such a crazy machine. The CLA 45 AMG has no competition at the moment. 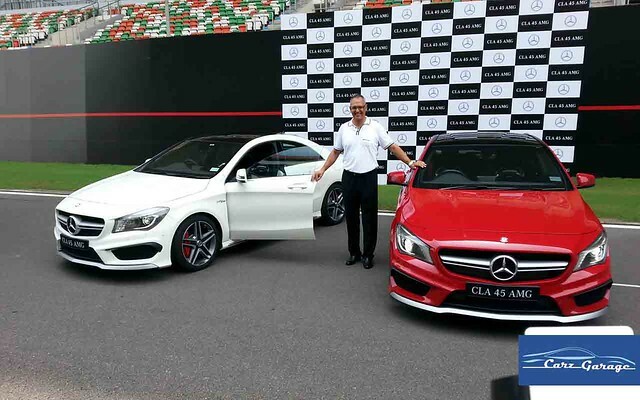 However, the standard Mercedes-Benz CLA sedan which will be launched in the next 6 months will have to compete with the Audi A3 sedan which will be launched in August 2014. The standard CLA will not get the AMG garnishing but it will still be a gorgeous car nevertheless. This review was first published on our site in the News section on 28th August 2014.